The Gunny Connector is part of the Lunch Loop Trail System in Grand Junction, Colorado. 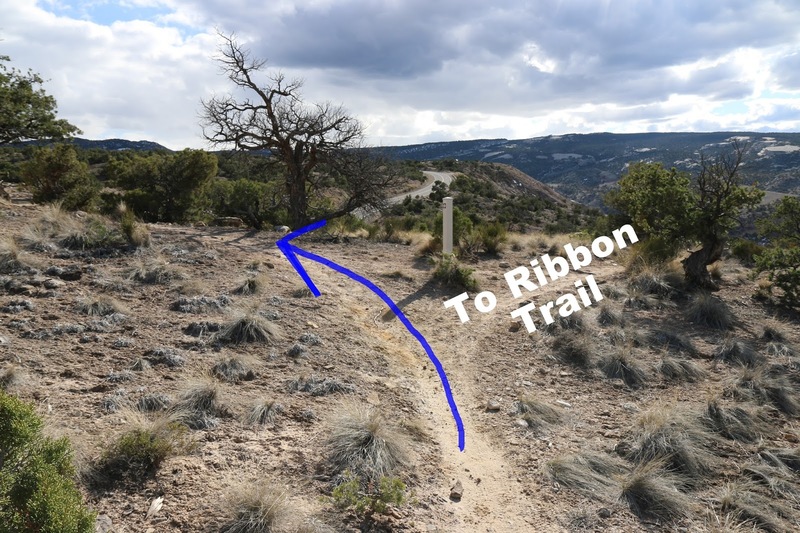 The trail begins near Little Park Road where it follows a route that snakes down the drainage and through a wash until eventually reaching the Gunny Loop trail at a point that is a little over a half mile from its trailhead on Little Park Road. 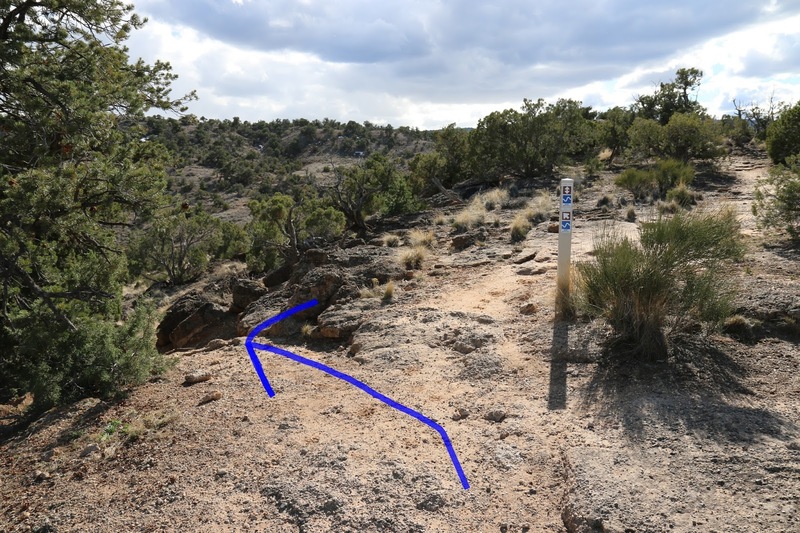 The Gunny Connector is only about 1 mile in length but depending upon where you begin it can take a half mile or more to get to either end of it. The this post we began at a parking area across from where the Tabeguache trail connects to Little Park Road in the vicinity of mile marker 10. The closest restroom is a short distance away at the Little Park Road trailhead. 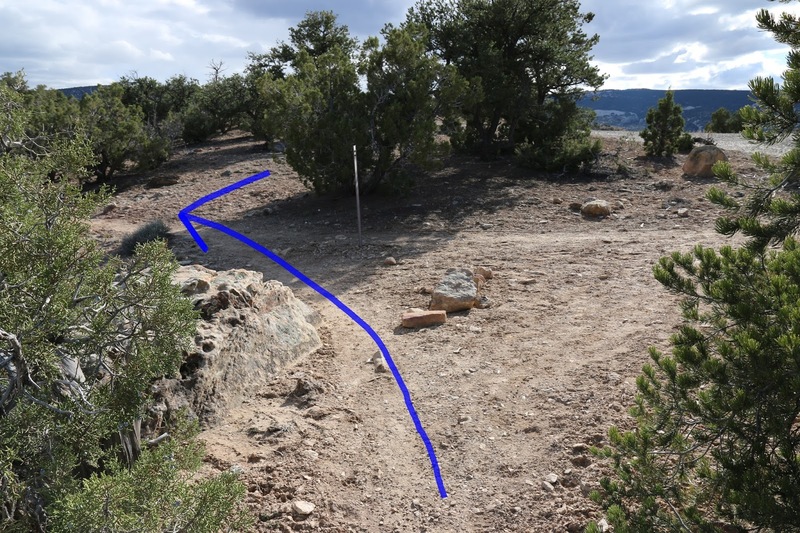 Look for the trail marker to the east of the parking area. A short segment of the Gunny Loop, that parallels the Little Park Road, has to be followed to get to the point where the Gunny Connector begins. Just past the half mile point the Gunny Connector branches off on the left. The trail takes a scenic route as it wraps around the terrain. Just before the 1 mile point there is another trail at the top of a small rise that breaks off and heads back across the road towards the Ribbon trail and Andy's Loop. From there the trail keeps climbing until it gets to the top of the little hill. The trail levels off a bit and shortly comes to another fork where the right branch can be followed to get over to the trailhead on Little Park Road. From that intersection the Gunny Connector begins a gradual descent that leads down to a nearby wash. The trail through the wash is primitive in nature but the scenery makes it very enjoyable. After working its way continually down the drainage the trail crosses over to a side wash and begins gradually climbing. The climb continues at a moderate pace as the trail sweeps around the side of the hill and eventually makes it up to the Gunny Loop where it comes to an end. 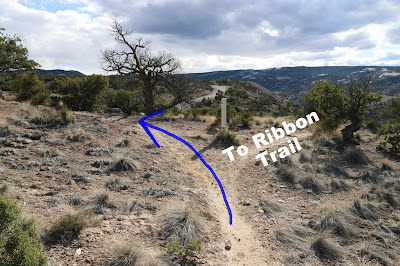 On the day that we were taking the photos for this post we ran into a couple of mountain bikers that had begun at the Little Park Road trailhead and set out on the Gunny Loop with their objective being to take advantage of the Gunny Connector to create a short 2 mile loop. We were doing the same thing although we were going in the opposite direction and we were hiking. However you go about it the Gunny Connector is worth checking out. If you would like to see it for yourself then all you have to do is grab your bike or 'Take a hike'.